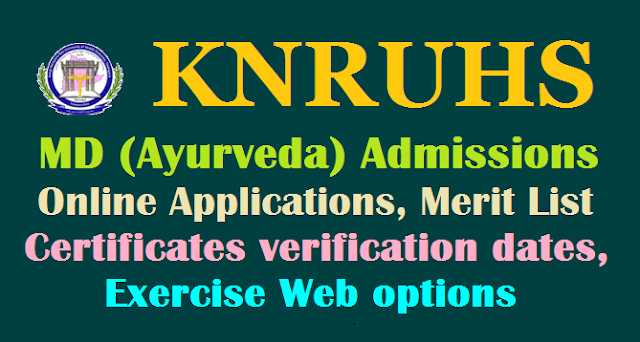 KNRUHS MD (Ayurveda) courses Admissions 2017, Apply online/ KNRUHS MD (Ayurveda) courses admissions smdayush.tsche.in, www.knruhs.in (Entrance test) 2017, KNRUHS MD (Ayurveda) courses admissions 2017, Online application form, Last date for apply online, Selection list Merit list Results, Web options, Certificates verification counselling dates and more details time to time available @ Website http://knruhs.in/. Kaloji Narayana Rao University of Health Sciences Telangana State has given notification for Admissions into M.D. (Ayurveda) courses available in Telangana under KNRUHS for the academic year 2017-18. Application forms through online are hereby invited from the eligible candidates for admission into M.D. (Ayurveda) courses for the academic year 2017-18 in Colleges located in Telangana State affiliated to Kaloji Narayana Rao University of Health Sciences, Warangal. NOTIFICATION FOR ON-LINE APPLICATIONS FOR ADMISSION INTO MD AYURVEDA COURSE FOR THE ACADEMIC YEAR 2017-18 UNDER KNR UHS. Applications on-line are invited from candidates who have appeared for AIAPGET-2017( Ayurveda ), whose names figure in merit list and who full-fill the eligibility for admission into MD Ayurveda Course for the academic year 2017-18 in BRKR Govt. Ayurveda Medical College, Hyderabad affiliated to KNRUHS. (Use internet Explorer 11 version) from 11.00 A.M. on 14-10-2017 to 5.00 P.M. on 20-10-2017. Candidates can apply on-line through web-site http://tsmdayush.tsche.in from 11.00 A.M. on 14-10-2017 to 5.00 P.M. on 20-10-2017. On-line application can be filled through any computer with internet connection with internet Explorer 11 version. 3. Those who passed equivalent Degree Examination included in the 2nd schedule of IMCC Act 1970. 4. The candidates should have completed internship by 31-07-2017. and they shall submit a Certificate to that effect. 6. Candidates who are already admitted and studying M.D. (Ayurveda) course shall not be permitted for counseling, until they discontinue the course before submitting the application form and such candidate shall submit the discontinuation certificate issued by the Head of the Institution along with the application. 7. Candidates who are already holding a Post Graduate Degree in Ayurveda in a subject shall not be eligible for admission into another P.G. Ayurveda Course. 8. For in-service candidates three years of regular service shall be calculated as on 31-07-2017. 9. Merit Position of the candidates who have applied on-line shall be determine based on AIAPGET-2017 (Ayurveda ) rank and percentile as per their eligibility. 10. In case of equal AIAPGET-2017 Rank the following criteria will be considered determining the state position. 11. Total aggregate marks obtained in BAMS Course. ( 1st Year to Final Year ) . 12. In case of equality of above criteria the date of birth will be considered, candidate born earlier will be considered as first in merit rank. Rs. 4,000=00 for OC/BC Candidates. 1.Keep all the following documents required ready. (a) AIAPGET-2017 ( Ayurveda ) Hall Ticket. (b) AIAPGET-2017 ( Ayurveda ) Rank Card. (c) Date of Birth Certificate. (j) Category Certificate if applicable. (k) Experience / Service Certificate. (n) Credit card / Debit card. 5. Admissions will be only for candidates whose names figure in the merit list of AIAPGET-2017 Ayurveda and KNRUHS, Merit list. 1. Availability of online Application From 10.00 A.M. on 14-10-2017 to 20-10-2017 up to 05.00 PM.